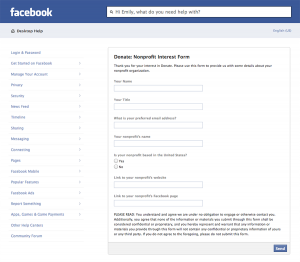 This week, Facebook launched a game-changing new feature for nonprofit organizations. You know the “like” button on your page, right under your cover photo? Soon, you’ll be able to put a “donate” button right there below it! Right now, it’s only available to about 12 large nonprofits as they beta-test it for a larger roll out. If you want to submit an application for your nonprofit for the Facebook donate button when it becomes available, click here. 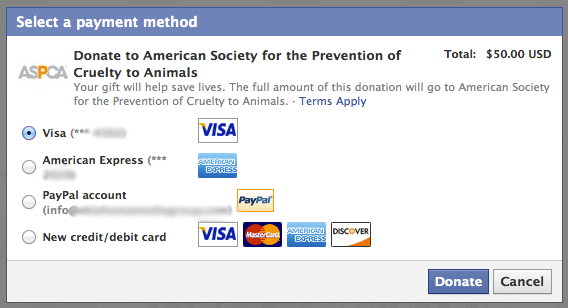 Facebook will NOT charge ANY transaction fees for processing your donations! That’s right–you will actually receive a full 100% of your donation! Thanks to the Donate Now button, instead of forcing your donors to LEAVE Facebook to make their donations (either via Paypal, on your website, etc) you can now accept donations in a pop-up window right on Facebook. The Donate Now button also gives people an easy way for people to share their action with friends, and encourage friends to donate as well. This is HUGE, particularly when you have a campaign, because people will want to encourage their friends to support the cause. Paypal processes the donation itself–so the transaction happens on their secure servers. You never see the credit card number or anything like that. As a page admin, you’ll receive a notification of the donation, and can send a thank-you letter, enter the person into your donor database, add them to your email list or whatever your process is when you receive a donation. It COULD be that they’re just genuinely nice. Big companies often practice amazing philanthropy, it’s true! So I think that’s definitely part of it. But if they make it easy to connect a donor with a nonprofit, they can also make it easy to connect that person to an advertiser. If I make a donation to your organization through Facebook, I have to give my payment information to Facebook (IE, my credit card information). I don’t personally doubt their security (although a hack is always possible), but I do recognize the “slippery slope.” Now that Facebook has my credit card stored and saved, it’s so very easy for me to make OTHER purchases on Facebook! Ideally, Facebook would like to process a LOT of transactions–let me buy shoes, gift certificates, cosmetics, etc.–and for those purchases, they WOULD collect a transaction fee (from the merchant). Considering that Paypal makes $3.4 BILLION a year just for processing our transactions¹, this could be an extremely lucrative endeavor for Facebook and its shareholders. That being said, I think this is still a HUGE game changer for nonprofits, and you should definitely apply! 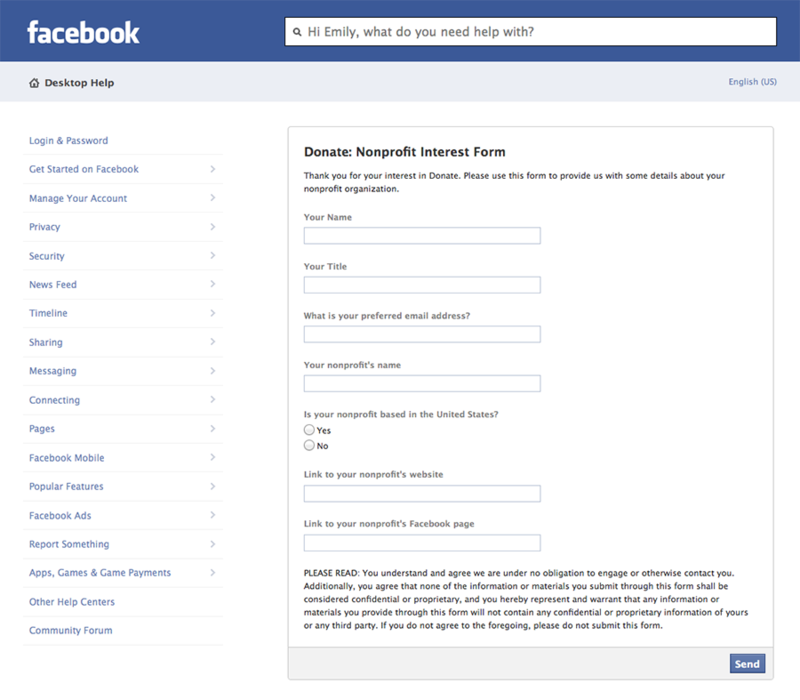 If you have a donate tab on your Facebook page, that’s fine–you can still keep that. It’s just another way people can give to you. But this makes it SO easy for people to give, as long as they are willing to allow Facebook to save their credit card information. Will it be successful? Only time will tell. If you fill out the form and apply to get your own donate button, let us know if you hear back! They haven’t said how soon they’ll be rolling it out to the “regular” nonprofits; hopefully soon. If you apply and hear any details, please post here and let us know! What are your thoughts? do you think you’ll use the Facebook donate button? 1. Source: Statistics Brain, http://www.statisticbrain.com/paypal-statistics/, March 2012. When you participated in the vicious, man-hating “I Hate Balls” campaign of Katherine Heigl, I swore I would never donate to you again. Thanks for this head’s up. Form completed and sent to Facebook. Received an acknowledgement and look forward to the next step when it becomes available! p.s. I don’t hate men! Thanks for the feedback, Lian! I hope they turn it on soon! Emily, thanks so much for being on top of this for us. I am passing this on to WeimRescueTexas! http://www.carenevis.org http://www.carenevis/org. it keeps coming back saying we have an invalid URL. any ideas ?? Do you think that perhaps facebook blocking us because we are not US based ? Janet–it’s looking for your Facebook URL, not your website URL. So Facebook.com/yourpagename. Go to your page on Facebook and just copy your URL. That should work! Has Facebook given any kind of guarantees the personal information will be safe and they won’t access it? M.Sooh–no, in fact the opposite is very true. Facebook makes no claim that they will not use donors’ personal information to market to them. That is the whole point of Facebook, really, from their view. They will not have access to their credit card information or sensitive data like that, but they will have access to their name, email address, Facebook page profile data, etc. They ALREADY have all of that, because this person has a facebook account. Hi Emily,..Thanks for this great info! I am more than happy to fill out the app. for the donate button for my org. I have been trying for 4 days to install the donate button using the static iframe button & it still doesn’t work. Its there,..and I have even used your work around tutorial for the error I was getting,..but now I get a different error. I think it has something to do with the paypal button,..even though I have created a new button that is not customized, it still doesn’t work. My last hope is this free donate button through facebook so I hope they start it soon! Being a volunteer myself,..Im so appreciate for all you are doing for animal org.s..its great to see people out there on our side. I do our fb page & also an article in the Stillwater Newspress (OK) every week,..which I love! Thanks again for everything you do for the animals! Hi Lisa, thanks for all the work you do in Stillwater! It looks like Facebook has removed the Donate button that I talked about in this article. Maybe it didn’t work or something. But the organizations that did have it (the large orgs like ASPCA) do not have it any more, unfortunately. The good news is you can still create your own donate button with Paypal, but it sounds like you are having some trouble with that. The video you are looking at on my site is old–Paypal has changed their look and interface quite a bit–but the static iframe tab still works exactly the same way. If you’re having a lot of trouble, I can do it for you for a small fee; just shoot me an email for more details. Hi Emily,..Thanks so much for getting back to me! I would absolutely love you to help us out by installing the donate button!!! I’m ready to pull my hair out!..lol. I really wish I would have found you BEFORE I tried to do it myself. I sent you an email and I look forward to hearing from you!